MIT’s contributions to energy innovation have led to technological breakthroughs and informed key public policies. This year, we celebrate over a century of energy at MIT and 10 years since MITEI’s inception. On any given day at MIT, undergraduates design hydro-powered desalination systems, graduate students test alternative fuels, and professors work to tap the huge energy-generating potential of nuclear fusion, biomaterials, and more. While some MIT researchers are modeling the impacts of policy on energy markets, others are experimenting with electrochemical forms of energy storage. This is the robust energy community at MIT. Developed over the past 10 years with the guidance and support of the MIT Energy Initiative (MITEI) — and with roots extending back into the early days of the Institute — it has engaged more than 300 faculty members and spans more than 900 research projects across all five schools. 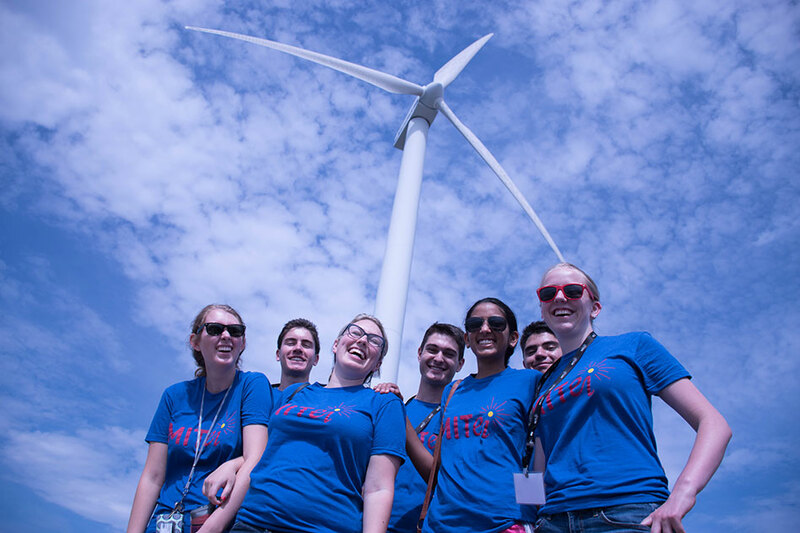 In addition, MIT offers a multidisciplinary energy minor and myriad energy-related events and activities throughout the year. Together, these efforts ensure that students who arrive on campus with an interest in energy have free rein to pursue their ambitions. Opportunities begin the moment undergraduates arrive on campus, with a freshman pre-orientation program offered through MITEI that includes such hands-on activities as building motors and visiting the Institute’s nuclear research reactor. “I got accepted into the pre-orientation program and from there, I was just hooked. I learned about solar technology, wind technology, different types of alternative fuels, bio fuels, even wave power,” says graduate student Priyanka Chatterjee ’15, who minored in energy studies and majored in mechanical and ocean engineering. Those who choose the minor take a core set of subjects encompassing energy science, technology, and social science. Those interested in a deep dive into research can participate in the Energy Undergraduate Research Opportunities Program (UROP), which provides full-time summer positions. UROP students are mentored by graduate students and postdocs, many of them members of the Society of Energy Fellows, who are also conducting their own energy research at MIT. For extracurricular activities, students can join the MIT Energy Club, which is among the largest student-run organizations at MIT with more than 5,000 members. They can also compete for the MIT Clean Energy Prize, a student competition that awards more than $200,000 each year for energy innovation. And there are many other opportunities. The Tata Center for Technology and Design, now in its sixth year, extends MIT’s reach abroad. It supports 65 graduate students every year who conduct research central to improving life in developing countries — including lowering costs of rural electrification and using solar energy in novel ways. Students have other opportunities to conduct and share energy research internationally as well. “What is important is to provide our students a holistic understanding of the energy challenges,” says MIT Associate Dean for Innovation Vladimir Bulović. This kind of thinking is at the root of MIT’s multidisciplinary approach to addressing the global energy challenge — and it has been since MITEI was conceived and launched by then-MIT President Susan Hockfield, a professor of neuroscience. While energy research has been part of the Institute since its founding (MIT’s first president, William Barton Rogers, famously collapsed and died after uttering the words “bituminous coal” at the 1882 commencement), the concerted effort to connect researchers across the five schools for collaborative projects is a more recent development. “The objective of MITEI was really to solve the big energy problems, which we feel needs all of the schools’ and departments’ contributions,” says Ernest J. Moniz, a professor emeritus of physics and special advisor to MIT’s president. Moniz was the founding director of MITEI before serving as U.S. Secretary of Energy during President Obama’s administration. “It’s the economics, it’s the sociology, it’s the science and the engineering, it’s the architecture — it’s all of the pieces of MIT that had to come together if we were going to develop really impactful sustainable energy solutions,” she says. This multidisciplinary approach is evident in much of MIT’s energy research — notably the series of comprehensive studies MITEI has conducted on such topics as the future of solar energy, natural gas, the electric grid, and more. “To make a better world, it’s essential that we figure out how to take what we’ve learned at MIT in energy and get that out into the world,” Armstrong says. MITEI’s eight low-carbon energy research centers — focused on a range of topics from materials design to solar generation to carbon capture and storage — similarly address challenges on multiple technology and policy fronts. These centers are a core component of MIT’s five-year Plan for Action on Climate Change, announced by President L. Rafael Reif in October 2015. The centers employ a strategy that has been fundamental to MIT’s energy work since the founding of MITEI: broad, sustained collaboration with stakeholders from industry, government, and the philanthropic and non-governmental organization communities. For example, MITEI’s members have supported more than 160 energy-focused research projects, representing $21.4 million in funding over the past nine years, through the Seed Fund Program. Projects have led to follow-on federal and industry funding, startup companies, and pilot plants for solar desalinization systems in India and Gaza, among other outcomes. What has MIT’s energy community as a whole accomplished over the past decade? Hockfield says it’s raised the visibility of the world’s energy problems, contributed solutions — both technical and sociopolitical — and provided “an army of young people” to lead the way to a sustainable energy future. Want to learn more about the history and future of energy research at MIT?